Blizzard has confirmed a remaster for Warcraft III is in the works and will release next year. Described as a "top-to-bottom upgrade," Warcraft III: Reforged will offer more than 60 campaign missions through the core story of Reign of Chaos and its expansion, The Frozen Throne. The campaign will also include over four hours of updated in-game cutscenes, so players can experience epic moments like the founding of Ogrimmar and the fall of Lordaeron in full, remastered glory. "Warcraft III is monumentally important to us here at Blizzard, and its influence is evident in everything we’ve done since," said Blizzard president J. Allen Brack. "A project like Warcraft III: Reforged isn’t something we undertake lightly, partly because of this legacy, but more importantly, because we know what it means to our players." Support for community-made content will also be coming with Reforged, thanks to an updated World Editor. In addition, existing custom maps will be playable in upcoming remaster. Integrated support through Battle.net will also allow players to utilise updated matchmaking systems. Since the original release of Warcraft III in 2002, a great number of changes to the lore and world have taken place thanks to the expanded universe of books and comics – but mostly due to the MMO World of Warcraft. As such, some changes have been made within Reforged to align the continuity of the franchise. The most notable example is the layout of Stratholme, the town through which Arthas laid siege in a desperate attempt to halt the Scourge's plague. 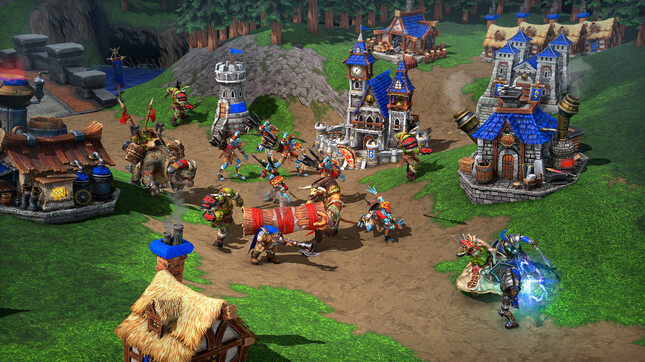 Since it was established in the original RTS, Stratholme has seen changes to its appearance and layout. Those changes have now been applied to Reforged, adding the town's iconic entrance, and starting players at the southern end of the map. I'm not sure about anyone else, but for me this was by far the most exciting news to come out of BlizzCon 2019. Remasters aren't for everyone, but given the impact Warcraft III had on both the RTS community and the series' storyline, I can't wait to jump back in and relive so many iconic moments. Warcraft III: Reforged releases next year and is available for pre-purchase now on Blizzard's Battle.net. There's even a couple of cool pre-purchase bonuses for players of WoW or Hearthstone.